Long time no post. Well let me catch you up on some things. See, schools out for the summer. I'm still working part-time doing tech stuff and I'm enjoying having more time with the kiddos. Abby's counts have been really good. She had a sinus infection from probably before we went to California until about 2 weeks ago when after the 4th round of antibiotics she finally kicked it and is feeling much better. She has a ton of energy! Hard to believe it is the same kid! I had to ask a couple people with older kids if this amount of silly energy is normal for her age! Abby had another Dr. Appt. with Dr. Smith at CHOA and everything looks good. They tested how high her Gamma Globulin is to see if they can take her off the monthly IvIG therapy or if they should wait. We'll probably go for another few months or maybe more depending on the results of her levels. Abby has been in Sunday School 3 times now and hasn't gotten sick! She is actually really running the gauntlet this week since she is doing VBS all week long with all those snotty kiddos! :) We'll see how it goes. The picture on the top is from when we went cabin camping up at Estes Park. 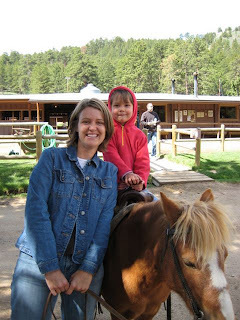 Anna and her went on a 30- minute pony ride and had a blast! Other than that, things are just normal... I mean really normal... kind of wierd, but I'll get used to it!